Bombardino is a small Italian eggnog cocktail made from three simple ingredients. It may be small but it’s mighty powerful and it’s the perfect way to warm up on a chilly and frosty winter’s evening. This will blow your mind (literally). Like eggnog? Then you’re gonna LOVE this little dessert. It’s made from an egg-based liqueur such as Zabov or Advocaat, brandy and whipped cream which is topped with a sprinkling of cinnamon. 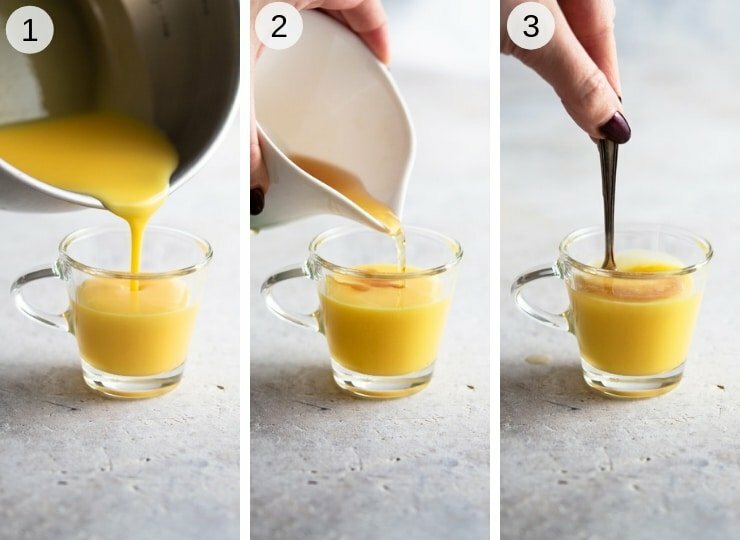 Unlike American eggnog recipes that are served in mugs in much bigger quantities, this Italian version is served in espresso cups or shot glasses. It’s not big but it’s just the right amount and you won’t be dissapointed! So What does Bombardino Mean? Bombardino literally means “little bomb” in Italian and it couldn’t be more appropriate. This little eggnog drink will knock your socks off and is sure to keep you warm and toastie all evening. It comes from the Italian Alps and is popular within ski resorts where you’d indulge and get cosy with one of these after a day on the slopes. It was apparently invented by a man who owned a ski lodge in Lombardia. After a group of skiers came into the lodge from an icy cold blizzard outside the man quickly mixed together Zabaglione (Italian custard), whiskey and milk. He heated it up and served it to the shivering skiers who then cried “Accidenti! È una bomba!” Blimey, it’s a bomb! and so the signature drink was created. 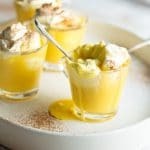 Zabaglione is a sweet and thick Italian custard and is incredibly delicious served in bowls with cookies for dunking. Traditionally, Il Bombardino would have been made with homemade Zabaglione but these days it’s been replaced with an eggnog liqueur that you can pick up in most supermarkets. Now, let me just say that eggnog liqueur such as Advocaat or Zabov Zabaglione is already pretty strong (well to me anyway) and it’s then mixed with brandy so this whole dessert is mighty powerful. Top Tip: If you haven’t been skiing all day and just fancy a fun little dessert you might want to skip the brandy or go with one of the other variations you can find below such as il Calimero which replaces the brandy with espresso (super delicious and less alcoholic). Heat the eggnog liqueur of choice in a saucepan over a medium heat until it’s just before boiling (don’t let it boil). Pour the liqueur into an espresso cup or a shot glass (photo 1). Add the brandy and stir until combined (photo 2 & 3). Top with a dollop of whipped heavy cream and dust with cinnamon. Super easy right? I like to mix some of the cream into the drink and eat it with a small spoon. I dunno about you but it’s extra cold and frosty here in the UK right now and after a long walk in the cold this is just perfect. It’s also my motivation for getting up and going for a walk in the first place, I mean, who doesn’t want to come back to one of these!? 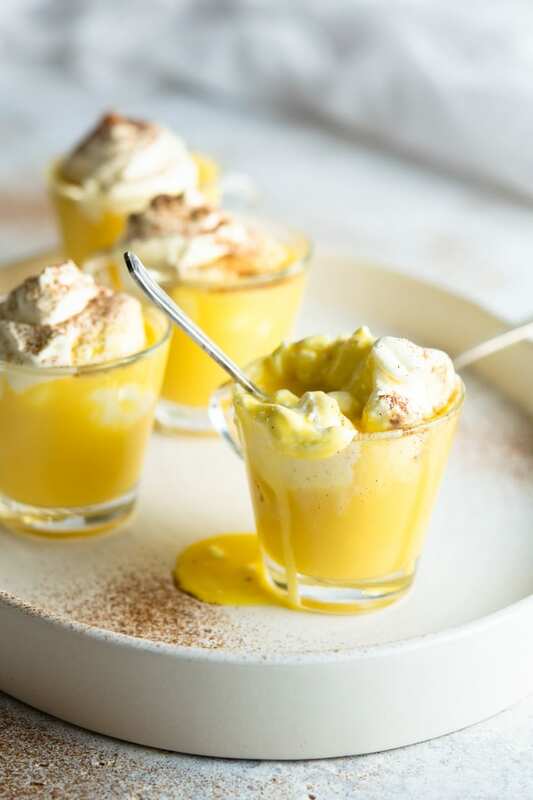 There are three well-known versions of Il Bombardino so you can go for the original or choose to switch it up slightly. This is not a large drink, serve in espresso cups like these ones. Don’t let the zabaglione liqueur boil as it will probably split, heat it gently until hot then serve. When whipping heavy cream I prefer to serve it still every so slightly soft and not over whipped. It’s a personal preference so you can choose what you like best! This is a strong alcoholic dessert so to calm it down simply skip the brandy or go for one of the variations above. You could also go all out and make your own Zabaglione, although it’ll take more time the taste will be well worth it. You can also control how much alcohol goes into the custard. This is traditionally served warm but can also be served cold if you prefer. 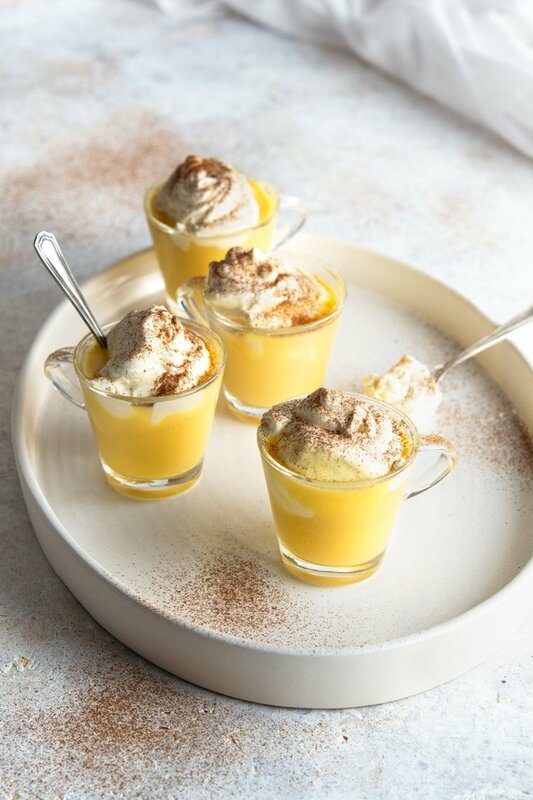 If you’ve tried this Bombardino Recipe or any other recipe on the blog please let me know how you got on in the comments below, I love hearing from you! You can also FOLLOW ME on FACEBOOK, INSTAGRAM and PINTEREST to see more delicious food and what I’m getting up to. Bombardino is a small Italian eggnog cocktail made from three simple ingredients. It may be small but it's mighty powerful and it's the perfect way to warm up on a chilly and frosty winter's evening. Heat the eggnog liqueur of choice in a saucepan over a medium heat and turn it off just before boiling. Pour the liqueur into an espresso cup or a shot glass. Add the brandy and stir until combined. Top with a dollop of whipped heavy cream and dust with cinnamon. This is not a large drink, serve in espresso cups like these. Don't let the zabaglione liqueur boil as it will probably split, heat it gently until hot then serve. When whipping heavy cream I prefer to serve it still every so slightly soft and not over whipped. It's a personal preference so you can choose what you like best! You could also go all out and make your own Zabaglione, although it'll take more time the taste will be well worth it. You can also control how much alcohol goes into the custard. Oh this looks SO good! I wish I had the ingredients to try right away..on my shopping list tomorrow! Can’t wait! It’s the perfect little treat for this snowy weather, hope you enjoy! These are so cute and I love the built in portion control! I’m going to have to be on the lookout for the eggnog liqueur! Oh I love the sound of this Italian eggnog! Looks amazing. This looks amazing and this recipe is genius! I have to serve this to my guests over the holidays! Thanks so much Neli, it would be perfect over the holidays! I love how easy this is and it will just be a marvelous dessert for after my huge lasagna dinner on Sunday a must try everyone will love this thank you! Now that sounds like a plan (craving lasagna now lol). Hope you love it, thanks Claudia! This sounds delicious! I love the american version of egg nog, so i’m sure this would be awesome as well. You have such great process shots too! So beautiful and easy to follow. Thanks so much Danielle, it’s super easy and if you love American eggnog you have to try this!